You are currently browsing the archives for the Working With JPAC category. 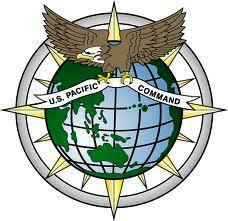 VIETNAM MIA: USPACOM & JPAC — A STRONG PARTNERSHIP! Forty-three years ago today — August 29th — my first husband, Capt Jerry Zimmer, USMC, was killed in Vietnam and eventually classified as MIA. The Joint POW/MIA Accounting Command (JPAC), headquartered at Hickam AFB in Honolulu, continues to search for his remains, along with those of his Radar Intercept Officer, 1st Lt. Al Graf. We don’t know if Jerry’s and Al’s remains will be found, but it won’t be for lack of trying on JPACs part. Jerry was everything to many of us, so we continue to hope, as does Al’s family. 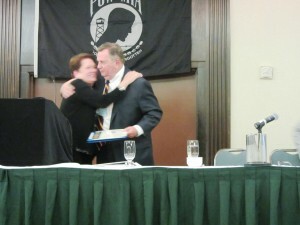 Vietnam War POW/MIA Meeting in D.C — Cautiously Optimistic! What a difference a year makes, as witnessed by 300-plus families and government officials at the 43rd annual meeting of the Nat’l League of POW/MIA Families in Washington, D.C. The mid June, two-day event featured speakers talking about a new spirit of cooperation between the Defense Prisoner of War/Missing Personnel Office (DPMO) and the Joint POW/MIA Accounting Command (JPAC); increasing investigations and excavations in all Vietnam War locations; ramping up archival searches in Vietnam and Laos, using every technique available; and touting a new way of identifying very impaired remains using isotopes. Although there was reason to be cautiously optimistic about the immediate future, there was a sense that the going could get a lot tougher down the road. Ann Mills-Griffiths was back at the helm, keeping everyone on their toes in her role as the League’s Chairman of the Board. Many speakers reiterated last year’s message that there would be NO ongoing MIA program for any past wartime group if it weren’t for the League, aka, Mills-Griffiths. The event was flawless, from beginning to end. With the exception of the current “bumpy” road in Laos, speakers gave high grades to the Asia/Pacific governments of Cambodia and Vietnam for their topnotch cooperation in our country’s quest to locate and repatriate MIAs from the Vietnam War. 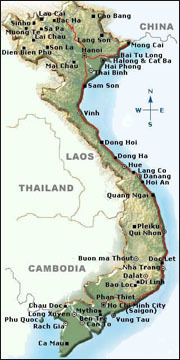 Still unaccounted for in Vietnam, 1282; Cambodia, 57; Laos, 318; and China’s territorial waters, 7, according to recently published figures. A few problems in Laos relate to that government’s insistence on jacking up the price of JPACs helicopter lease, currently leaving one helicopter in the air for field operations; foot travel to sites has been nixed by the Lao government as too dangerous but travel by vehicle to some sites has been approved — even though tourist activity appears unrestricted in many of the same general areas; and giving Stony Beach full reign to investigate potential in-country sites or sightings beyond scheduled field activities has yet to be approved by the Lao government. Despite the less than perfect report card for Laos, JPAC is far from writing off this important area where we still have several MIAs. Most people familiar with Laos believe that strides will be made, but it will be slow going. The much anticipated discussion about resumption of the U.S. — Russia Joint Commission (USRJC) on POW/MIAs after a six-year hiatus is still a work in progress. The League’s primary interest in the commission is to gain access to all Russian archives and witnesses with information pertaining to the fate of MIAs who disappeared without a trace during the war years. Undoubtedly, the emergence of DASD Winfield at DPMO, was a major highlight of the three-day event. Winfield assured families that his appointment signaled a new beginning of cooperation between DPMO and JPAC, both of which have roles within the POW/MIA community. Winfield replaced Robert Newberry, USAF (Ret), whose management style created somewhat of a wedge between DPMO and JPAC, as well as with the League. Winfield is not a stranger to JPAC, since he was its first Commander during a time in which the Hawaii-based organization metamorphosed from the Joint Task Force-Full Accounting (JTF-FA) in 2004 to become JPAC. No doubt, Winfield was handpicked for the position, knowing that the 30-year career Army officer could cross “party lines” and get the job done as an insider, rather than a newcomer. Yet, these are tough times, and Winfield’s biggest challenge may be in carrying out his marching orders, while still keeping the peace with all the stakeholders in the MIA community. MG Tom discussed a litany of changes, including JPACs budget increase of $30 million annually, between FY 2012-FY 2016, to accomplish the increased recovery/identification demands imposed by the 2010 Nat’l Defense Authorization Act (NDAA). Having received the first $30-million increase in FY2012, MG Tom cautioned that the issue will be how to get the rest of it. A new Central Identification Laboratory (CIL) facility is expected to be ready at Hickam AFB in Hawaii in late 2014, and a satellite lab soon will open on the mainland at Ofutt AFB in Omaha, NE. The new Vietnamese Recovery Team (VRT) concept has been so successful in Vietnam that JPAC is looking at using that model in other past wartime areas, too, in an ongoing quest to save money. MG Tom noted the accomplishments of longtime civil service employees in Hanoi’s Detachment 2 — Ron Ward, Casualty Resolution Specialist, who also received a special award this year from the League; Dan Young, Logistics Specialist; and Buddy Newell, Linguist, all of whom report to LTC Patrick Keane, Commander of Det 2. Also lauded was Johnie Webb, Deputy to the JPAC Commander at Hickam AFB, whose 3-plus decades of service cover all past wartime conflicts. Of great interest to families with concerns about the CILs ability to make identifications from severely impaired remains, CIL Director Dr. Tom Holland discussed a breakthrough that can be applied to certain cases through the use of stable isotopes. Holland described how isotopes helped lead to an identification of an American F-100 pilot who was shot down in the mid 1960s in a mountainous area of Laos. Among the material evidence found were minimal remains (not suitable for DNA testing), along with life support gear, dog tags, etc, making it seem likely that the pilot known to be flying that aircraft had not ejected but was in the plane when it crashed; however, it wasn’t until the lab determined– through the use of stable isotope analysis – that the remains did, in fact, belong to that pilot, permitting the CIL to make a conclusive identification, giving his family an opportunity for closure. The use of stable isotopes can determine a person’s diet and ecology during the last 10 years of their life. Using carbon, nitrogen and oxygen testing methods, the CIL was able to determine that the diet, water, etc, in the case mentioned here was consistent with an American from a particular part of the United States, not a person of Asian/Lao ancestry. This is very exciting news and should help speed up identification of remains when there is an important piece of the puzzle missing. The reality of the 2010 NDAA was not a big issue at this year’s meeting; however, Verga discussed the impending deadline for JPACs CIL to produce 200 identifications a year by 2015, saying that it was not simply to reach that magic number but to sustain it, from that point forward. “We need to build the capacity,” he said, explaining that a revision of DoD accounting strategy would be “comprehensive, collaborative and integrated.” “A major element of this strategy will be to examine how to best accomplish this vital mission in today’s challenging fiscal environment.” Translation: Enjoy the glow, because tough love is just around the corner.